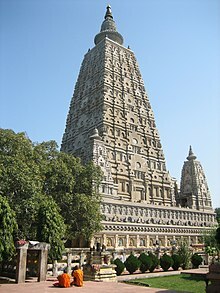 The Mahabodhi Temple (literally: "Great Awakening Temple"), a UNESCO World Heritage Site, is an ancient, but much rebuilt and restored, Buddhist temple in Bodh Gaya, marking the location where the Buddha is said to have attained enlightenment. Bodh Gaya (in Gaya district) is about 96 km (60 mi) from Patna, Bihar state, India. 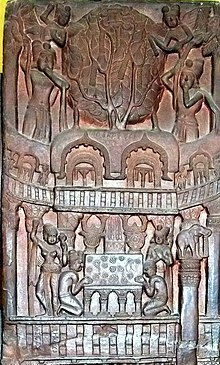 The site contains a descendant of the Bodhi Tree under which Buddha gained enlightenment, and has been a major pilgrimage destination for Hindus and Buddhists for well over two thousand years, and some elements probably date to the period of Ashoka (died c.232 BCE). What is now visible on the ground essentially dates from the 7th century CE, or perhaps somewhat earlier, as well as several major restorations since the 19th century. But the structure now may well incorporate large parts of earlier work, possibly from the 2nd or 3rd century CE. 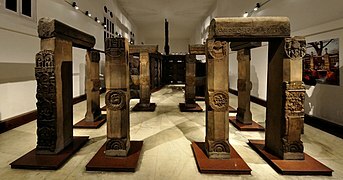 Many of the oldest sculptural elements have been moved to the museum beside the temple, and some, such as the carved stone railing wall around the main structure, have been replaced by replicas. The main temple's survival is especially impressive, as it was mostly made of brick covered with stucco, materials that are much less durable than stone. 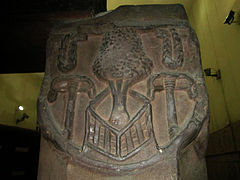 But this means that very little of the original sculptural decoration has survived. 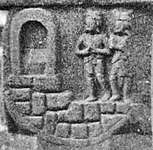 Ashoka's Mahabodhi Temple and Diamond throne in Bodh Gaya, built circa 250 BCE. 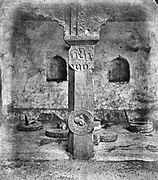 The inscription between the Chaitya arches reads: "Bhagavato Sakamunino/ bodho" i.e. "The building round the Bodhi tree of the Holy Sakamuni (Shakyamuni)". 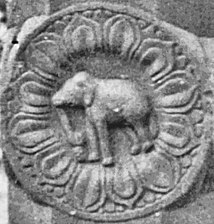 The elephant-crowned pillar of Ashoka (now lost) is visible. 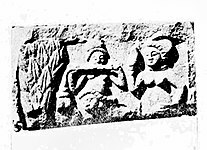 Bharhut frieze (circa 100 BCE). 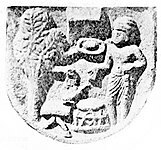 Another relief of the early circular Mahabodhi Temple, Bharhut, circa 100 BCE. During the second week, the Buddha remained standing and stared, uninterrupted, at the Bodhi tree. This spot is marked by the Animeshlocha Stupa, that is, the unblinking stupa or shrine, to the north-east of the Mahabodhi Temple complex. There stands a statue of Buddha with his eyes fixed towards the Bodhi tree. The Buddha is said to have walked back and forth between the location of the Animeshlocha Stupa and the Bodhi tree. According to legend, lotus flowers sprung up along this route; it is now called Ratnachakrama or the jewel walk. He spent the fourth week near Ratnagar Chaitya, to the north-east side. During the fifth week, Buddha answered in details to the queries of Brahmins under the Ajapala Nigodh tree, now marked by a pillar. He spent the sixth week next to the Lotus pond. He spent the seventh week under the Rajyatna tree. 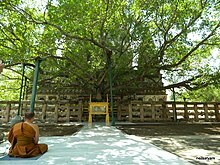 The Bodhi tree at Bodhgaya is directly connected to the life of the historical Buddha, Siddhartha Gautama, who attained enlightenment or perfect insight when he was meditating under it. 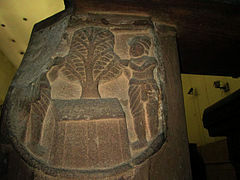 The temple was built directly to the east of the Bodhi tree, supposedly a direct descendant of the original Bodhi Tree. There remains however the Diamond throne, which he had established at the foot of the Bodhi tree. 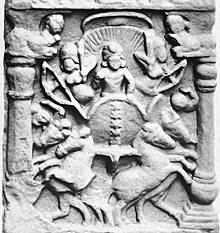 The Diamond throne, or Vajrasana, is thought to have been built by Emperor Ashoka of the Maurya Empire between 250-233 BCE,. at the location where the Buddha reached enlightenment. It is worshiped today, and is the center of many festivities at the Mahabodhi Temple. 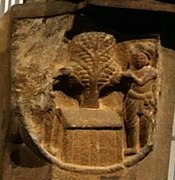 Representations of the early temple structure meant to protect the Bodhi tree are found at Sanchi, on the toraṇas of Stūpa I, dating from around 25 BCE, and on a relief carving from the stupa railing at Bhārhut, from the early Shunga period (c. 185–c. 73 BCE). 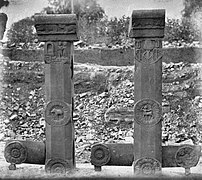 Reconstitution of the Sunga period pillars at Bodh Gaya, from archaeology (left) and from artistic relief (right). They are dated to the 1st century BCE. Reconstitution done by Alexander Cunningham. Additional structures were brought in by the Sungas. In particular, columns with pot-shaped bases were found around the Diamond throne. These columns are thought to date to the 1st century BCE, towards the end of the Sungas. 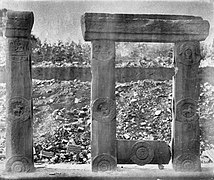 These columns, which were found through archaeological research at the Buddha's Walk in the Mahabodhi Temple, quite precisely match the columns described on the reliefs found on the gateway pillars. 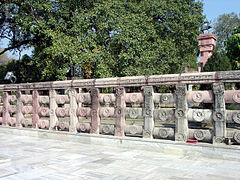 The railing also around the Mahabodhi Temple at Bodh Gaya is quite ancient. 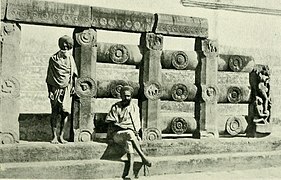 These are old sandstone posts dating about 150 BCE, during the Sunga period. 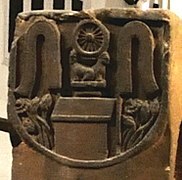 There are carved panels as well as medallions, with many scene similar to those of the contemporary Sunga railings at Bharhut (150 BCE) and Sanchi (115 BCE), although the reliefs at Sanchi Stupa No.2 are often considered as the oldest of all. 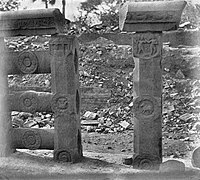 The railing was extended during the following century, down to the end of Gupta period (7th century), with coarse granite decorated with elaborate foliate ornaments and small figures as well as stupas. 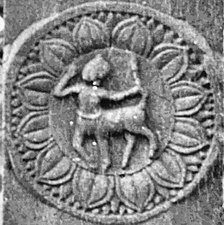 Many parts of the initial railing have been dismantled and are now in museums, such as the Indian Museum in Kolkota, and have been replaced by plaster copies. Early photographs of the railings (Henry Baily Wade Garrick, 1880). 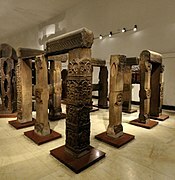 Remains of the railings in the Indian Museum, Kolkata. 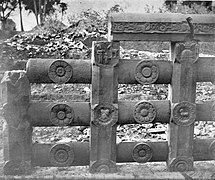 Bodh Gaya original railings, Indian Museum, Calcutta. Adoration of the Bodhi tree. The Jetavana Garden at Sravasti. 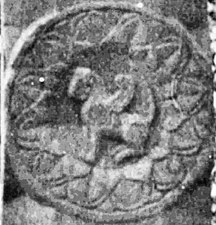 Woman with child and goat. 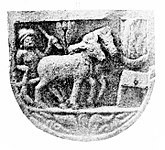 Visit of Indra to the Indrasala Cave. 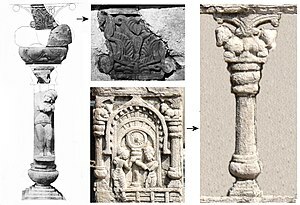 Plaster copy and reconstruction of original Sunga railing. 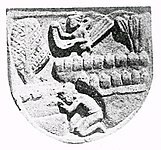 Adoration of the wheel of the Law (plaster copy). Flower Design decorated with gold leaves. 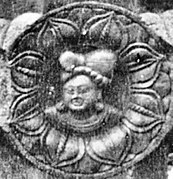 While Asoka is considered the Mahabodhi temple's founder, the current pyramidal structure dates from the Gupta Empire, in the 5th–6th century CE. 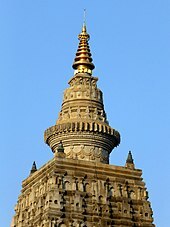 The stupa finial on top of the pyramidal structure. 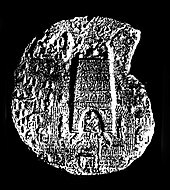 It is thought that the temple in the shape of a truncated pyramid was derived from the design of the stepped stupas which had developed in Gandhara. 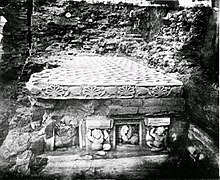 The Mahabodhi Temple adapted the Gandharan design of a succession of steps with niches containing Buddha images, alternating with Greco-Roman pillars, and top by a stupa, as seen in the stupas of Jaulian. 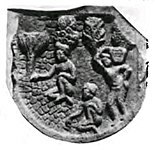 The structure is crowned by the shape of an hemispherical stupa topped by finials, forming a logical elongation of the stepped Gandharan stupas. 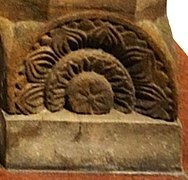 This truncated pyramid design also marked the evolution from the aniconic stupa dedicated to the cult of relics, to the iconic temple with multiple images of the Buddha and Bodhisattvas. 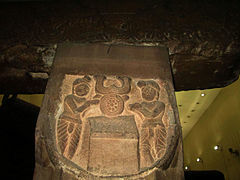 This design was very influential in the development of later Hindu temples. 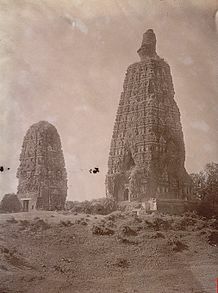 The "shikhara" tower with an amalaka near the top is today considered more characteristic of Hindu temples. The Temple was restored by the British and India post independence. 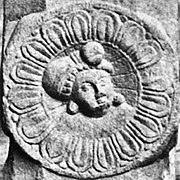 Buddhism declined when the dynasties patronizing it declined, following Huna invasions and the early Arab Islamic invasions such as that of Muhammad bin Qasim. 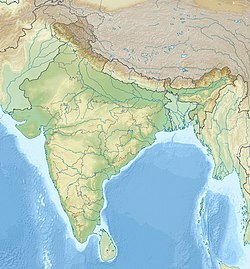 A strong revival occurred under the Pala Empire in the northeast of the subcontinent (where the temple is situated). 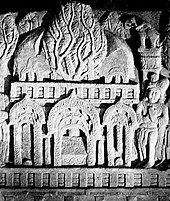 Mahayana Buddhism flourished under the Palas between the 8th and the 12th century. 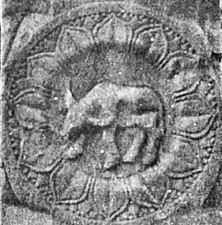 However, after the defeat of the Palas by the Hindu Sena dynasty, Buddhism's position again began to erode and became nearly extinct in India. 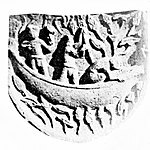 During the 12th century CE, Bodh Gaya and the nearby regions were invaded by Muslim Turk armies. 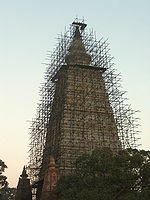 During this period, the Mahabodhi Temple fell into disrepair and was largely abandoned. 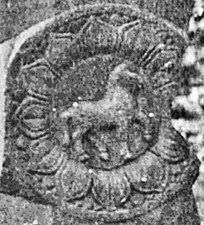 Over the following centuries, the monastery's abbot or mahant position became occupied by the area's primary landholder, who claimed ownership of the Mahabodhi Temple grounds. During the 11th century and the 19th century, Burmese rulers undertook restoration of the temple complex and surrounding wall. 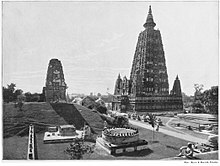 In the 1880s, the then-British colonial government of India began to restore Mahabodhi Temple under the direction of Sir Alexander Cunningham and Joseph David Beglar. In 1885, Sir Edwin Arnold visited the site and under guidance from Ven. Weligama Sri Sumangala published several articles drawing the attention of the Buddhists to the deplorable conditions of Buddhagaya. 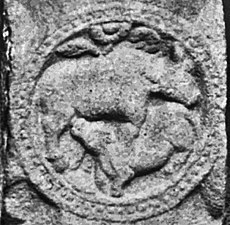 Bodh Gaya quadriga relief of the sun god Surya riding between pillars (detail of a railing post), 2nd-1st century BCE. The Mahabodhi Temple is surrounded on all four sides by stone railings, about two metres high. The railings reveal two distinct types, both in style as well as the materials used. 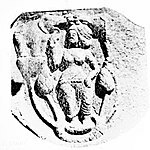 The older ones, made of sandstone, date to about 150 BCE, and the others, constructed from unpolished coarse granite, are believed to be of the Gupta period. The older railings have scenes such as Lakshmi, the Hindu/Buddhist goddess of wealth, being bathed by elephants; and Surya, the Hindu sun god, riding a chariot drawn by four horses. The newer railings have figures of stupas (reliquary shrines) and garudas (eagles). Images of lotus flowers also appear commonly. In 1891, a campaign to return control of the temple to Buddhists, over the objections of the Hindu mahant. As of June 2017[update], the temples head monk was Bhikkhu Chalinda. In 2013, the upper portion of the temple was covered with 289 kg of gold. The gold was a gift from the King of Thailand and devotees from Thailand, and installed with the approval of the Archaeological Survey of India. On 7 July 2013, ten low-intensity bombs exploded in the temple complex, injuring 5 people. One bomb was near the statue of Buddha and another was near the Mahabodhi tree. Three unexploded bombs were also found and defused. The blasts took place between 5.30 a.m. and 6.00 a.m. The main temple was undamaged. The Intelligence Bureau of India may have alerted state officials of possible threats around 15 days prior to the bombing. On 4 November 2013, the National Investigation Agency announced that the Islamic terrorist group Indian Mujahideen was responsible for the bombings. ^ "World Heritage Day: Five must-visit sites in India". Archived from the original on 2015-08-14. ^ a b c d e f g h "Mahabodhi Temple Complex at Bodh Gaya". UNESCO. Archived from the original on 29 November 2014. Retrieved 6 January 2015. 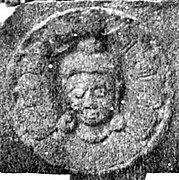 ^ "Tipitaka, Khuddaka Nikaya, Kaligga Bodhi Jataka, Jataka N:o 479". Internet Sacred Text Archive. Archived from the original on 9 May 2015. Retrieved 6 January 2015. ^ Ching, Francis D. K.; Jarzombek, Mark M.; Prakash, Vikramaditya (2010). A Global History of Architecture. John Wiley & Sons. p. 231. ISBN 9781118007396. ^ Richard Maxwell Eaton; Professor Richard M Eaton (1993). The Rise of Islam and the Bengal Frontier, 1204-1760. University of California Press. p. 14. ISBN 978-0-520-08077-5. ^ "History of Bodh Gaya, India, Place of Buddhas Enlightenment". BuddhaNet. Archived from the original on 2013-10-06. Retrieved 2014-03-03. ^ Dipak K. Barua, "Buddha Gaya Temple: its history"
^ a b Geary, David; Sayers, Matthew R.; Amar, Abhishek Singh (2012). Cross-disciplinary perspectives on a contested Buddhist site : Bodh Gaya jataka. London: Routledge. pp. 29–40. ISBN 978-0-415-68452-1. ^ D.C.Ahir (1994). Buddha Gaya Through the Ages. Delhi: Sri Satguru Publications. pp. 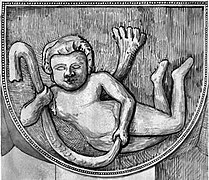 127–133. ISBN 81-7030-409-1. ^ a b c d Buddhists seek control over Mahabodhi temple management Archived 2008-03-30 at the Wayback Machine IANS. March 28, 2008. Retrieved March 29, 2008. ^ "The Controversial Bodhgaya Temple (Amendment) Bill 2013". Archived from the original on August 7, 2013. Retrieved 1 October 2013. ^ Scandal gnaws at Buddha's holy tree in India Archived 2008-04-09 at the Wayback Machine. Denyer, Simon. Reuters News Service. February 3, 2008. Retrieved March 27, 2008. ^ No damage to Bodhi tree: Govt Archived 2009-02-14 at the Wayback Machine. Singh, Sanjay. July 21, 2006. Retrieved March 27, 2008. ^ "Holiest Buddhist shrine gets governing panel, finally". Thaindian.com. 2008-05-17. Archived from the original on 2010-06-23. Retrieved 2010-04-24. 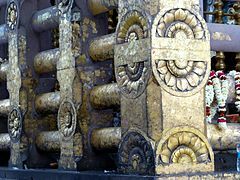 ^ "300 kg gold gift from Thailand gives Bodhgaya temple a new look". India Today. Archived from the original on 2014-03-04. Retrieved 2014-03-04. ^ a b "Serial Blasts rock Mahabodhi temple in Bodha gaya: terror attack, Center says". The Times of India. 7 July 2013. Archived from the original on 9 July 2013. Retrieved 7 July 2013. ^ Law, Kumar Mishra (7 July 2013). "5 injured in multiple blasts at Mahabodhi temple in Bodh Gaya". The Times of India. Archived from the original on 23 October 2015. Retrieved 7 July 2013. ^ "Security beefed up in city, Bodh Gaya – The Times of India". The Times Of India. ^ Tiwari, Deeptiman (6 November 2013). "Ranchi document helps NIA crack Bodh Gaya blast case". Times of India. Archived from the original on 6 November 2013. Retrieved 6 November 2013. ^ Gaikwad, Rahi; Yadav Anumeha; Pandey Devesh (7 November 2013). "Patna terror cell behind Bodh Gaya strike too: NIA". The Hindu. Patna, Ranchi, New Delhi. The Hindu. Archived from the original on 9 November 2013. Retrieved 7 November 2013. Doyle, Tara N. (2003-09-11). Liberate the Mahabodhi Temple! Socially Engaged Buddhism, Dalit-Style. In: Steven Heine, Charles Prebish (eds), Buddhism in the Modern World. Oxford University Press. pp. 249–280. ISBN 0-19-514698-0.
von Schroeder, Ulrich (2001). Buddhist Sculptures in Tibet. Vol. 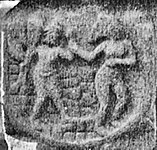 One: India & Nepal; Vol. Two: Tibet & China. Hong Kong: Visual Dharma Publications, Ltd. ISBN 962-7049-07-7. Mahãbodhi temple, known to the Tibetans as rDo rje gdan («dorje den») (Skt. 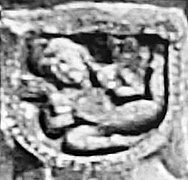 : Vajrāsana), pp. 103, 212, 216, 219, 246, 320–351, 356, 360, 369, 395, 396, 677, 707, 708, 870, 1242; Fig. IV–1. Replicas of the Mahābodhi temple in Tibet, pp. 321–351; Figs. IV–2–5; Pls. 111, 112, 113A–C, 113D–F, 114A–C, 114D–F, 115A–C, 115D–F.